There are no user reviews for WestHost. The public name of the company. A short description of this company. Offers web hosting, dedicated servers, e-commerce, shopping carts and web marketing tips. Estimated annual revenue of this company. Estimated number of employees of this company. List of other domain names that are owned by the same owner as this site. Number of public contacts listed at Jigsaw.com. Description of this company available at Jigsaw.com. 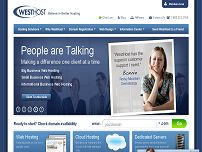 Begun in 1998, WestHost has had a singular goal to provide the most powerful, secure Web hosting environment in the world at an affordable price. Since that first day, we have provided hosting for clients all around the world. We have maintained ourselves as a leader in the Web hosting industry by keeping to that original goal providing the best technology available with exceptional customer support. The work ethic and integrity that established our business has paid off with many industry awards and happy customers. With a large client base comes a diverse range of Web hosting requirements. We have tailored our company around these needs by providing flexible and scalable services. These services include Shared Web Hosting, Cloud Hosting, Dedicated Servers, Reseller Hosting, Domain Registration, E-commerce Tools, Web design, and Merchant Account solutions. In 2008 the UK2 Group, a large worldwide Web hosting provider, expanded its global presence with the acquisition of WestHost. By leveraging the combined power of multiple hosting companies under the UK2 Group umbrella, we are able to provide our customers with an exceptional Web experience at affordable rates. Our efforts and focus are always directed to our clients and their needs. We will continue to maintain ourselves as a low-cost, complete Web hosting provider, while maintaining a solid infrastructure, secure environment, unfailing and redundant connection, and superior 24/7 client support. The date the domain of this site was first registered. A measure of the site's popularity. The rank is calculated using a combination of average daily visitors and pageviews over the past 3 months. The site with the highest combination of visitors and pageviews is ranked #1. A measure of the site's popularity in US. The rank is calculated using a combination of average daily visitors and pageviews from users from US over the past 3 months. The site with the highest combination of visitors and pageviews is ranked #1 in US. A measure of the site's reputation. The number of sites linking to this site. Multiple links from the same site are only counted once. Median website load time and percent of known sites that are slower. Up to 3 DMOZ (Open Directory) categories for the specified site. Name and description of the official Twitter profile of this company. "Since 1998, WestHost has been an affordable Web hosting provider of low cost internet services, and viewed as a leader in the Web hosting industry." Physical address of this company. Official phone number of this company. Official fax number of this company. Official email address of this company. Link to the "Terms of service" page published by this hosting provider. Can Instagram Work For Your Business? What’s With All The Cloud Hosting Buzz? Simplifying Your Life – How Long Would It Take To Binge-watch A TV Series? Is Your Site Optimized For Mobile Use? Use the button below to login to HostMonk using your Facebook account. Logging in to HostMonk allows you to receive notifications about special deals and receive our newsletter. In the near future we plan to add many cool features such as viewing your recent searches and automatically search for the most affordable plans relevant to you. Hosting Providers: You can use our management console to manage your packages. New providers, please contact us.